Canter safari is a common safari in that 16 people can accommodate in a time, it is a shared safari, Canter is like a mini Bus or you can say a mini RTV bus. Canter safari goes to Dhikala zone which is the middle part of Corbett Tiger Reserve or Corbett National Park and well known for its density and beauty. Dhikala canter safari is the best option to visit Dhikala zone if you do not have a permit of night stay over there. 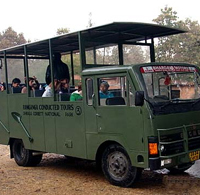 It is another medium to visit core area of corbett national park,we have two canter safaris in a day one is from 0600 Hrs in the morning and another one is in the afternoon from 1200 Hrs Both are around 06 Hrs Long to enjoy this safari one need not to stay at dhikala or other accmmodation inside the park.